Robe hooks are the perfect way to store any bathroom robes in a neat and practical manner. We have an extensive range of designs that are certain to add both radiance and style to your home. 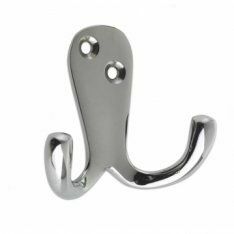 Amongst our range, we have both contemporary and traditional robe hooks for sale which have been made from high quality and long-lasting materials like chrome and stainless steel. Toilets in both domestic and commercial buildings will need to have toilet roll holders in place to ensure toilet roll is in easy reach at all times. We have a selection of designs that operate with either static or rolling mechanisms. One of our signature models is the polished chrome tempo toilet paper holder, which comes complete with all the required fixing screws, wallplugs and fixing plates. Towel rails are also in sure supply, these allow any towels to be neatly stored within bathrooms. We only offer strong and dependable designs to ensure they withstand a long life within your bathroom. You can choose from single, twin or curved models, depending on your preferred style. It’s also important to ensure any hand towels are stored correctly since they are typically used to dry hands. That’s why we have two high quality towel rings available, to ensure any hand towels are placed in easy reach and kept away from dirty surfaces. We have the satin stainless steel towel ring and the polished chrome tempo towel ring, which have both been manufactured by Carlisle Brass. Maintaining a clean and tidy bathroom can be further achieved with either of our soap dishes and dispensers. We have a satin stainless steel soap dish or a polished chrome tempo triangular soap basket. Both models are suitable for commercial and domestic use and come with a 10-year mechanical warranty. Many households which are occupied by families will have a number of toothbrushes that will require appropriate storage. Using one of our tumbler and toothbrush holder products, you will be able to keep toothbrushes stored in a practical manner. Our designs are wall mountable with some adopting a frosted glass effect. It is equally important that any toilet brushes are stored correctly. Any of our toilet brush holders will ensure brushes are kept clean and ready for use. Within our range, we have three wall mountable models that have been made with either stainless steel or polished chrome. In order to keep all your bathroom essentials stored neatly and within easy reach, you will need to install any of our bathroom cabinets. Depending on the space required, we have both single and double panel cabinets which either come fully assembled or with a simple self-assembly format. We also have a selection of bathroom mirrors which suit a variety of purposes. We have small pedestal mirror designs for people who want to shave or apply makeup, as well as larger models which allow people to see full reflections. Our Apollo mirror with integrated lighting is one of our more innovative designs, allowing the user to light up the mirror by simply pulling on a cord. By using any of our bathroom shelves and storage products, you will be able to keep any bathroom essentials stored in a neat and methodical fashion. We have three models which are part of a modern contemporary range and come as standard with a 10-year mechanical guarantee. Showering areas are another space within bathrooms that will need to be properly equipped. It’s important to have any of our shower curtain rails in place, since they will add much needed structural integrity to your shower. You will then be able to attach shower curtains & rings, which ensures water remains within the showering area of your bathroom. Grab rails will need to be installed into any homes that have a bath tub in place. This will ensure that there’s a strong and sturdy aid in place to help people enter and exit baths in a safe and secure manner. Finally, we have two pull out airers available which can be used for both inside and outdoor balconies and store flat against the wall when not in use.